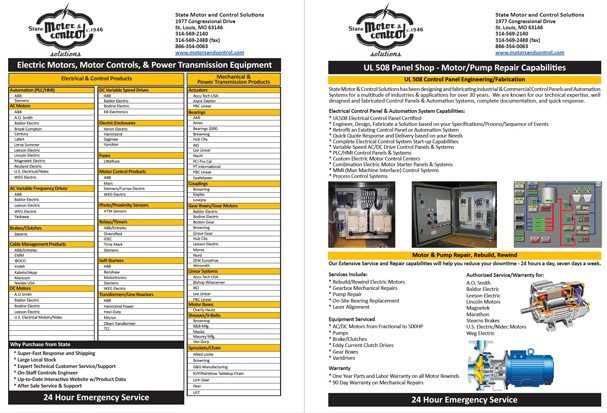 State Motor and Control Solutions has been designing and fabricating Industrial and Commercial Electrical Control Panels and Automation Systems for a multitude of industries/applications for over 25 years. State Motor & Control Solutions, started in 1946, is under its third generation of family ownership and management. Specializing in electric motors, motor controls (starters, contactors, and relays) electrical clutches and brakes, electrical enclosures, belts, sheaves, chains, sprockets, gearboxes and mechanical power transmissions equipment, also provides electrical motor repair and rewind services. Thanks for the price quote on ball bearings. Wonderful customer service and being helpful with my questions thank you!